Let’s get down to business Captain America is the best movie I’ve seen all summer. Captain America is the best Marvel movie since Iron Man. It has the heart of the first Superman movie with Indiana Jones’ spirit of adventure. Want to know why and why you HAVE to stay after the credits? Read on. Captain America begins in the present with the discovery of Captain America aka Steve Rogers (Chris Evans) frozen in ice. From there we flashback to World War II era America, where a young 98 pound weakling named Steve Rogers has been turned down by the army for the fourth time. Steve won’t take no for an answer which catches the notice of Dr. Erskine (Stanley Tucci) who recruits him for the top secret Super Soldier project. Despite being physically, Dr. Erskine insists that Steve be the test subject for the Super Soldier serum because he has a good heart. Reluctantly the army agrees and Steve goes from 98-pound weakling to Olympic decathlete. A Nazi spy assassinates Professor Erskine and with him the secret of the Super Soldier formula. So what does the army do with Steve? Turn him into a USO act named Captain America. 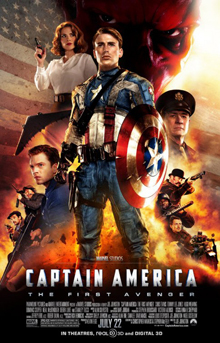 All that changes when he learns his best friend James “Bucky” Barnes (Sebastian Stan) is captured Nazi organization HYDRA led by the Red Skull (Hugo Weaving). Steve then embarks on a one-man rescue mission leading him to discover that HYDRA is developing a mysterious technology that could change the course of the war. Captain America is how I would’ve wrote it, specifically the World War II setting. By setting the movie in World War II, we see why Captain America is so special. He’s the personification of the greatest generation, a time when people were willing to sacrifice for the greater good. A time when there was a clear line between good and evil. Chris Evans was Steve Rogers. He looked the part both when he was 98 pounds and when he became Cap but what really set him apart was how he kept Steve Rogers as the same person nobody which body he inhabited. Even as Captain America, he still didn’t know how to dance. On the other side, Hugo Weaving’s Red Skull is ruthless and power mad. He believes he has a divine mission to usurp Hitler and rule the world. What really impressed me about Weaving was how he portrayed the Red Skull as Captain America’s dark reflection. Both men took the Super Soldier and while Steve became the physical embodiment of the Aryan, the Red Skull turned into a monster and it’s eating at him inside. One could say the physical appearance of these sworn enemies is a reflection of who they are as people. Hayley Atwell did a good job as Agent Peggy Carter. Next to Erskine, she is the only person who sees the potential in Steve, even though he’s physically weak. She sells this through her eyes and facial expressions. Speaking of Erskine, Stanley Tucci does a terrific job of acting as a surrogate father to Steve. You know he really cares about Steve and doesn’t think of him as a lab rat. It reminds me of Pa Kent. Finally, there is Dominic Cooper as Howard Stark, the father of Tony Stark aka Iron Man. Lets just say the phrase “like father, like son” sums up everything. Despite it’s great cast, Captain America wouldn’t be what it is without director Joe Johnston. Johnston is no stranger to World War II period pieces. He directed The Rocketeer and was an art director on Raiders of the Lost Ark. (There’s even a homage to Indiana Jones) The detail put into recreating New York during World War II is astounding. Everything from the sets to the costumes to the newsreel footage to language spoken by the characters, all came together to transport us back to a world we only heard about in stories our grandparents told us. The only thing missing was the smoking. Another thing that impressed me about Johnston was he was unafraid to make this movie a straightforward adventure. There are no shades of gray in this film, there’s a clear line between good and evil. Where heroes do daring deeds to thwart the villain’s vile plan. It’s simple but it works and reminds you of why movies are so magical. Now, as with all Marvel movies, there is a sequence at the end of the credits. Stay for this, even if you’re in an 80-degree theatre with no air conditioning. What do you see? Your first glimpse at the one movie with the potential to give The Dark Knight Rises a run for its money, The Avengers. Why? Captain America, Thor, Iron Man, the Hulk, and Black Widow together in one movie. Need I say more? Thanks to a wonderful cast, director, and nerdgasm of a post credit sequence, Captain America is a rollicking good time that invokes the spirit of the golden ages of cinema and comics. See it…and stay for the post credit sequence.